Why do we need a baseball batting helmet? Everyone knows, so let’s skip that intro part. If you’ve decided to buy a youth baseball helmet then you should know a few important things before making the purchase. One of the most important things that you should check is, your helmet should meet NOCSAE Standards and follow all the baseball helmet safety ratings. Don’t buy if the helmet is not NOCSAE Approved. In this article, I tried to present each & everything that you’ll need to find your best helmet. I recommend you read to the end, but, if you’re in a hurry, then this next section is for you. Where to Buy a Good High School Batting Helmet? For small kids, my number one recommendation is Rawlings Coolflo T-Ball Helmet. 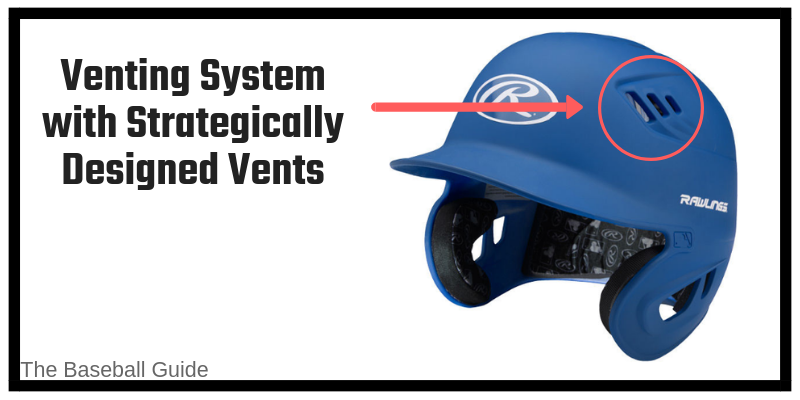 The coolflo design with strategically design vent holes provides air circulation in the helmet. It fits 6.25’’ – 7.8”, and it meets the NOCSAE Standards. You can also attach NOCSAE approved face mask or jaw guard on the pre-drilled holes. As kids like colorful helmets, so you can find this helmet in a bunch of different colors. It is tried & tested that comes at a very affordable price. I’ll recommend you to try DeMarini Paradox Protege Pro Batting Helmet of Youth or S/M size as per your kids head. This is a general recommendation, and I suggest you check the circumference of your kid’s head first. As in the elementary school age, kids grow fast and in one or two years the size of their head changes. So, this is the age where you have to check the circumference of your kids head, and then purchase a helmet. A general recommendation can be wrong for elementary age kids. Before going any further, you should take a look at the customer reviews, and see yourself how happy they are after purchasing this inexpensive but high-quality batting helmet. For middle school junior players, the best baseball helmet is Easton Junior Z5 Batters Helmet. The ABS Shell provides protection from high impacts. As kids play for hours, and they sweat a lot. Therefore, Easton added Dual Density Foam in it that absorbs any sweat and keeps your head dry. It meets all the NOCSAE Standards, so your kid can use it in all levels of play whether it’s Baseball or Softball. The good protection comes at a very affordable price. There is no need to spend big bucks on the helmet if you can purchase Easton Z5 Helmet. It is inexpensive, tried & tested by hundreds of young players and their parents. When it comes to high school players, the best helmet is DeMarini Paradox Protege Batting Helmet. The Dual Density padding along with the low profile shell perfectly fits your head. This padding also absorbs any sweat and keeps your head dry, while the strategically placed vents improve the airflow. The different color options along with the clear design that follows all the NOCSAE Standards makes this helmet number choice of high school baseball players. We all know the common things about a helmet that it should be comfortable. After wearing it, if you’re thinking again and again when the game will be over and you’ll get rid of this helmet that means you’ve purchased a wrong helmet. Fitting should be proper. It should stay in place when you do your head movements. Sometimes, parents purchase a large size helmet for their kids that they can wear for years. But, a large size helmet falls forwards the eyes and thus can be very distracting. So avoid purchasing a large size, but if you want a helmet that your kid can wear for seasons then adjustable helmets can be a good choice. You can also watch this short video which’ll be helpful to you. Other important things that you need to consider are given below. 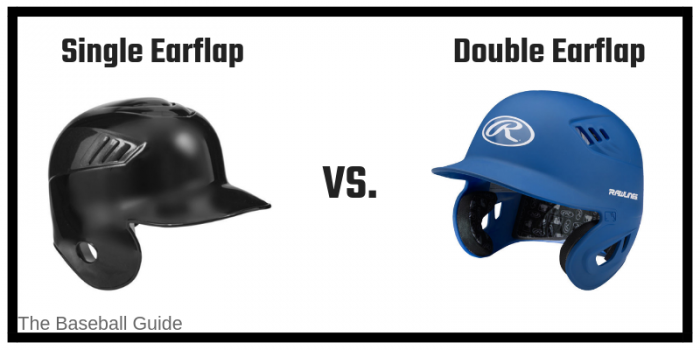 Are you looking for one earflap batting helmet, just like MLB players? Or, do you want two earflap helmets, for protection? In MLB, it is mandatory to wear at least one earflap baseball helmet. They can also wear two earflap helmets if they want. But, in MLB, hitters generally wear one earflap helmets. But, personally, I’ll recommend you to choose two earflap helmet because that provides protection to both the ears. The one earflap helmet provides protection to only one ear that means your one ear is at risk. So, my suggestion is, go with two earflap helmet. Safety is the main concern. Even, some leagues also recommend their players to wear only two earflap helmets. If your helmet has face mask then it provides safety to your face. The helmet is just for your head, but if you really want a safe helmet that provides full protection then do not ignore face mask. Even, there are some leagues that require helmets that include a face mask. The junior players or kids should wear helmets with a face mask because they’re not well trained to handle each and every fast pitch that comes towards them. In that case, the face mask will be very helpful. But, unfortunately, in most of the cases, you have to purchase face guard separately. There are some brands that give face guard along with a helmet, but the majority of brands do not give any mask or cage. Some players don’t use a face mask, so they just use baseball helmet with jaw guard that only provides protection to the cheek and jaw. 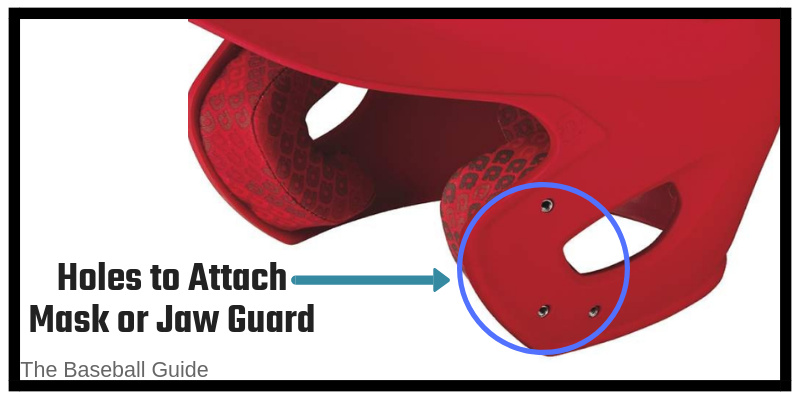 The jaw guard is strategically designed face protector that can be mounted on one side of the helmet. This protects the one side of the batter’s face which is exposed to the pitcher. The jaw guard becomes very important for the young players who have not developed enough skills to protect themselves from the unexpected pitches. The jaw guard provides the necessary protection to the cheek, ear, and the jaw. 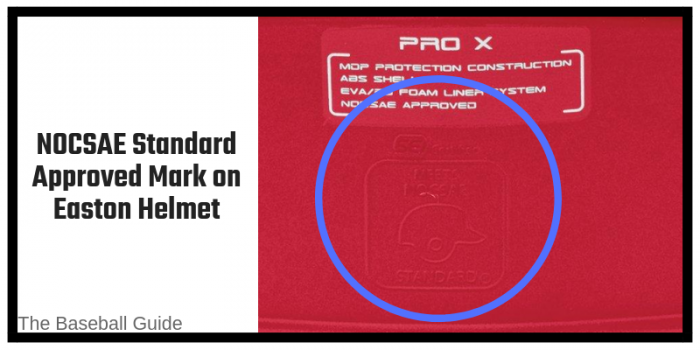 In every NOCSAE Approved batting helmet, you can find pre-drilled holes where you can attach a standard size jaw guard. Even, some professional MLB players also use jaw guard to protect themselves because just one simple helmet attachment can save you from an unexpected pitch. When buying a jaw guard, make sure you order the right one because some right batters order left batters jaw guard and that consumes extra time for replacing. 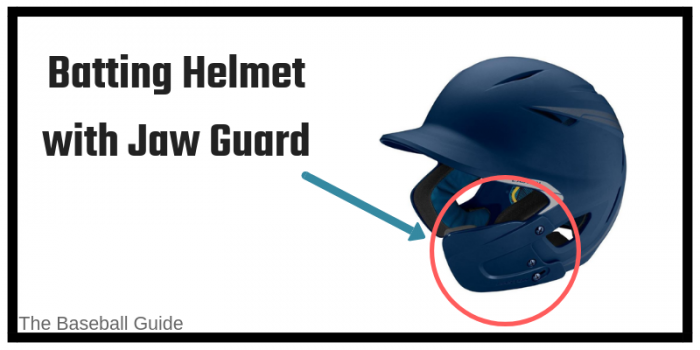 The Markwort Batter’s C-Flap Face Protector is the best option if you want a jaw guard because this standard jaw guard can be easily mounted on any batting helmet with minimum adjustments. It is also available many different colors, so you can find a jaw guard that’ll match with your helmet’s color. We all know that the helmet should be comfortable. It should not be too tight or too lose. But, if you’re buying it from online stores like Amazon, then you wouldn’t want to replace it again and again until you find the perfect size. For that, you should know the size of your head. For knowing the size of your head, you just have to measure your full head circumference. Simply measure from the forehead, from around the head, and then back to the forehead. If you’re facing any difficulty in it, then watch this very short video from Easton. Rawlings also published various charts that show helmet sizing charts and for other baseball equipment. NOCSAE (National Operating Committee on Standards for Athletic Equipment) is a committee that develops performance standards for the protective equipment that are used in the various sports. NOCSAE have developed many specific baseball helmet safety ratings, but that looks confusing and difficult to grab all that details. But, if you want to take a look at the baseball equipment standards developed by NOCSAE then you can check their baseball section. There is no need to know about all the NOCSAE standards, but whenever you purchase a baseball helmet make sure you confirm that it meets NOCSAE standards. I highly recommend that you only purchase a helmet that is manufactured according to NOCSAE standards. If the product is according to the standards, then you can find it in their product description on the online stores. If you like to purchase from your nearby sports equipment store, then take a close look at the box or ask from the shopkeeper if necessary. So, I think, you got the point. You can find them at sports equipment stores, but personally, I prefer online e-commerce stores. If I become more specific, Amazon is my top choice. I prefer Amazon over others because it’s trusted by millions of users, and you can find a lot of genuine reviews of a product. If you don’t like it, then you can return the item. And, most importantly, it is the place where you can get the best deals. This is one of the most popular batting helmets for junior players and it is manufactured by Easton, which is one of the most trusted manufacturers of baseball equipment for more than 40 years. Easton Z5 Grip Helmet has all the great features that help it to compete with other brands, but when it comes to style & color combination, nothing is close to Easton Z5 Helmets. Easton gives you various color options from which you can choose any color as per your personal preference. You can choose any color that’ll suit with your team uniform. This is a really good feature because many brands only offer 3 to 4 color options. I have rejected many products just because I didn’t like the color, and therefore, if I can purchase a youth batting helmet as per my color requirement, then it’s a really good thing for me. It is not like this helmet is all about style, grip finish & colors. It’s a durable baseball helmet for middle school players. The outer protective shell is made of ABS plastic. The Acrylonitrile Butadiene Styrene (ABS) is a thermoplastic polymer that is an ideal material when there is a need to impact resistance, stiffness, and strength. The tough outer protective shell gives you protection again any impacts. It consists of dual density foam that is made up of high density & low-density foam. The high-density foam works as an excellent shock absorber, while the low-density foam provides comfort and BioDri Liner absorbs sweat and keeps it away from the head. Wrapped ears make it highly durable when used in constant play. The Easton Z5 Helmets meet the NOCSAE standards for Baseball batting helmets, and therefore it is NOCSAE Approved. If you take a close look at the Z5 helmet, you’ll see that there are vented holes that provide maximum ventilation which is a really good thing. For the extra protection, you can also attach the face guard with the Z5 helmet. For that, there are pre-drilled holes available on the sides. But, you have to purchase the face guard separately. This Easton Junior Z5 Helmet size is 6 3/8” – 7 1/8”, and therefore, it’s a good fit for middle school players. The price is not the issue with this helmet. It’s affordable. If you check online, you’ll find that there are a few Easton Helmet sub-models that the company sells under Z5 models like Z5, Z5 2Tone, and Z5 Grip. These Easton helmets are almost the same. They are just different from each other because of their style. So, if you can purchase any model you like whether it is Z5, Z5 Grip or Z5 2Tone. Vented holes for maximum ventilation. Various color combinations with stylish appearance. Pre-drilled holes to attach face guard. Tried & tested by hundreds of players. Need to purchase face guard separately. DeMarini is another well known and trusted name among Baseball players. This brand is popular because of the high-quality sports equipment they manufacture. In the DeMarini Paradox Batting Helmet, you’ll find strategically placed vented holes that provide maximum airflow which keeps your head cool. In some helmets, you’ll find that vented holes are not present or they’re not strategically designed which results in very limited airflow. But, DeMarini has tested their helmet and it’ll keep you cool through the airflow. The dual density padding fitted inside gives you both safety and comfort. The low profile outer shell gives you a superior fit. Its rubberized matte shell protects you from the impact of any ball or collision with other players. Along with that the outer shell’s glossy finish also looks good. If you wear glasses, even then there will be no problem. It’s not like they created special slots for glasses arms, but you can wear glasses along with this helmet. The various color options also make it a good choice as you can buy your preferred color as per your uniform. It meets all the NOCSAE standards which give you confidence on the field that you’re safe with DeMarini Paradox. 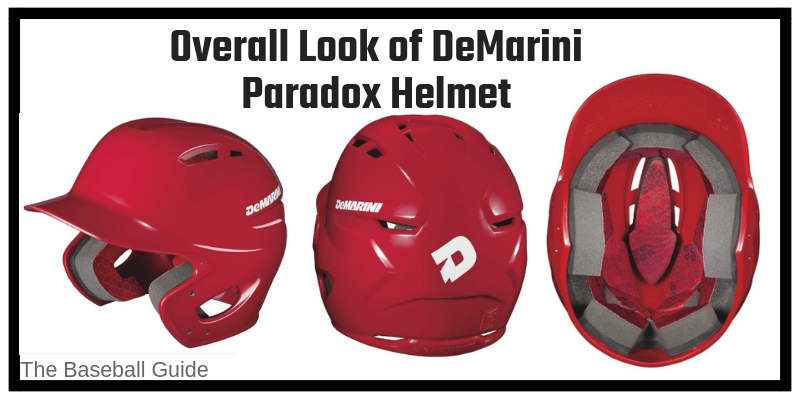 This DeMarini Paradox Helmet comes in three different sizes. These are based on hat size. For the average kids of 7 to 8 years of age, the YH size is a good option. But, I highly recommend you that before buying any helmet you measure the size of the head of your kid. The size of the high school helmet depends on their head size. They can wear S/M size or L/XL size depending on their head size. So, with that size, this can be a great high school batting helmet. Note: There is a version of DeMarini Paradox Protégé Helmet that comes with a face mask. But, if you’re looking for a baseball helmet then purchase the mask separately because this cage is too wide and it’ll not be able to stop all the baseballs from getting through it. So, my suggestion is, buy the DeMarini Paradox Helmet that comes without a cage, and purchase the face mask separately. As there are pre-drilled holes, so there’ll be no problem in attaching the cage. Different color & style options. Provides excellent protection with a rubberized shell. Strategically designed holes for maximum ventilation. Tried & Tested by hundreds of baseball players. Need to purchase face mask separately. Mizuno is a Japanese sports equipment company that was established in Osaka, Japan in 1906. The Company is producing really good products from over a decade and therefore, it has established a special reputation in the United States also. It has all the good features like other helmets, but the feature that makes it different from others is its adjustability and that what makes it costly. It happens with a lot of players that the S/M size helmet is too tight for them, and when they try L/XL size, it’s too loose for them. This is a common problem because it’s not practical to manufacture helmets that differ by millimeters from each other. In that case, Mizuno MVP G2 Helmet is the savior. There is a small wheel at the back of the helmet to adjust the size. The adjustable baseball helmet is a really good choice because you do not have to purchase any other helmet for years when your kid grows. The problem with standardly sized helmets is that when a kid grows they become tight, and you have to buy another one with a large size. But, with the adjustability feature, your kid can wear this helmet for years. The size of the Mizuno MVP Helmet is 6 1/2″ – 7 1/2″ that means, it is adjustable from the 6 1/2” size to the 7 1/2” size which is really a good size range. If you want to use your adjustable helmet for years, then it should be durable. And, yes, the Mizuno baseball helmet is durable which can protect you from fast pitches for various seasons. It has a two-tone matte finish shell that gives you a beautiful color combination. The EVA foam inner core provides cushioning and comfort while the DryLite liner keeps the sweat away from the players head & face. Just like other top brands, Mizuno helmet has pre-drilled holes for the face guard or jaw guard but it doesn’t come along with the helmet. If you want a face mask or jaw guard for baseball helmet, then you’ve to purchase separately. Mizuno also uses durable ABS plastic shell which you can find in some other top brands. It meets NOCSAE standards, so there is no need to worry about the quality & standards. When it comes to color combination, you can find various different colors that can match with your uniform. If we talk about the price, then it is slightly costly as compared to other helmets of popular brands like DeMarini, Rawlings, or Easton. If you want a good quality helmet but you’re on a tight budget, then this is not for you. But, the adjustable feature is worth the price you’ll pay. Adjustability is the strongest feature it offers. Good helmet for a wide range of sizes. Pre-drilled holes available but need to purchase face mask separately. Price is slightly higher than other standard size baseball helmets. In 2006, Rawlings first introduced the COOLFLO technology, and it revolutionized batting helmet design and the inbuilt venting system along with the aerodynamic look. With the traditional coolflo design and strategically placed vented holes provides maximum airflow to the players head. The dual density padding gives comfort as well as protection from any mishappening. The young players love its professional design that comes with various color options with a molded finish. It meets all the NOCSAE standards. It is a good fit for the players of head size 6.5” to 7.5”. If we talk about age, then it should be for 9 years or older kids. This is not for 3 to 4 years old kids. Along with that, it may be too tight for the large head, so avoid purchasing it for high school kids having a large head. You can purchase your Rawlings Baseball Helmet with Gloss or Matte Finish. The cheaper coolflo helmet model comes with a gloss finish and some users don’t like that. When it comes to price, you can’t refuse this helmet on the basis of price. It is very affordable or even cheaper than its competitor brands. Just like other brands, Rawlings give pre-drilled holes for face mask & jaw guard, but, you’ve to purchase them separately. COOLFLO Technology gives maximum ventilation. Gives professional look with good color styles. Some users don’t like the gloss finish, according to them it looks like a cheap model. Not a good option for high school players having a large head. If you have a son or daughter of 3 to 4 years old then Easton Tee Ball Helmet is the safest helmet you can purchase. It has the slimmest profile and a great aerodynamic venting system makes it one of the best baseball helmets on the market. The high-quality ABS shell gives durability and provides maximum strength which will protect your kid from any wrong throw or collision. The soft urethane comfort foam makes it best fit and comfortable for wearing, while the Bio-Dri antimicrobial fabric liner absorbs moisture and provide a new level of comfort. 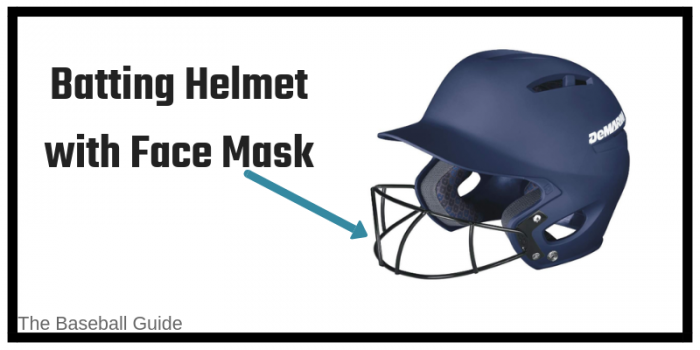 It meets all the NOCSAE standards of baseball helmets, so you need not to worry about the safety of your kid while wearing this helmet. It fits 6 – 6 ½ size or 20 inch – 22 ¼ inches. If your son or daughter is 3 to 4 years of age, then this is a perfect helmet for them. As soon as you take it out of the packing box, you’ll realize that this is a good choice for your young kids. I like that this helmet comes with a face mask. There are very few helmets that offer face guard attached with the helmet at such a good price. As small kids need extra safety measures, therefore, always look for the baseball helmet with chin strap. And I really love that this is one of the rarest baseball helmets that comes with face guard and chin strap both. All I can say is, if this helmet fits your kid, there is no need to look at other options. Comes with Face Guard and Chin Strap. Good fit for the small kids. Affordable Price – you’ll love the quality at such a good price. Various Color Options are not available. So, these were the best youth baseball helmets that the young players can use in their game. Whatever brand you consider, whatever product you buy, but I’ll suggest you use baseball helmet with a face mask because it provides protection from any mishappening. I hope this article helped you in making your decision. Which is your favorite batting helmet for youth?